Trivium Pursuit is pleased to announce the release of their newest children's picture book Bless the Lord: The 103rd Psalm. This is the second in the Illustrated Psalm series by artist Johannah Bluedorn. In addition to the 30 paintings illustrating the text, the psalm is set to music. About the author/illustrator: Johannah Bluedorn has been homeschooled all her life and is self-taught in art. Skilled in the use of a variety of media, Johannah has illustrated several other children's books, including Little Bitty Baby Learns Hebrew, My Mommy My Teacher, The Lord Builds the House: The 127th Psalm, and The Story of Mr. Pippin (all published by Trivium Pursuit), and From Dark to Dawn: A Tale of Martin Luther and the Reformation and Raising Maidens of Virtue (both published by Books on the Path). In her spare time, she raises Jersey cows, trains her horse, and enjoys many types of handwork. Johannah lives with her family in New Boston, Illinois. Her message is clear-- Extol virtue and eschew evil. All throughout the book there is that deep sense of gratitude she causes us to think about. While the illustrations will warm your heart, the scriptures shout out His Glorious praises through her fingers. What are the illustrations telling us? Whether you are a homemaker, writer, father--- serve the Lord your God with all your heart, with all your soul, and with all your mind while you live. As you read each scripture and look at the corresponding illustratation, you will see many benefits God has blessed you with. Look at the ill child... you'll be reminded of the times you or your children were sick in bed. You'll remember how you recovered because God strengthened your frail body. Since we live in a culture that is ungrateful, you can't help but notice this ungodly attitude illustrated in some children's book. You can protect your children's eyes while feasting their eyes on virtuous illustrations. Place in front of your children's eyes the moral goodness that is inherent in this book. Parents can use this pictorial guide of the 103rd Psalm to teach their children to be grateful and forget not all His benefits. The art not only moves you to tears, but also causes you to think about your moral obligation to God out of a sincere heart that loves God. P.S. Johannah, I like the little purple bottle of echinacea sitting on the window sil. Bless the Lord: The 103rd Psalm and The Lord Builds the House: The 127th Psalm both richly illustrated by Johannah Bluedorn have become a regular part of our bedtime reading routine. With several children snuggled next to me I read these Psalms as they enjoyed the inspired watercolor and ink artworks that celebrate God's creation. Miss Bluedorn used vibrant colors to illustrate both texts of these beloved Psalms from the King James translation of the Bible. Each page is a visual feast for the eyes. There is so much intricate detail on each page that we find something new each time. I confess I didn't see the angels in Bless the Lord until my 3rd reading. My four-year-old daughter has been so taken in by the beauty of the artwork and the poetry of the Psalm that she often spontaneously echoes me as I say each line. At this rate she should have Psalm 103 and Psalm 127 memorized in no time. Both of these hardcover books are bound with high quality paper and will endure many years. At the back of each book the Psalms have been set to music in the plain song or chant style by Harvey Bluedorn. I am also reading these books to my Sunday school class at church. So much of the Sunday school literature I am given to teach with is greatly shortened paraphrases of Scripture. While this may be appropriate in part for the 3-5 year old age range, my class is much delighted to hear and see the full text of Psalm 103 and Psalm 127. The detailed illustrations really help this wiggly group of preschoolers to sit still. As I read Bless the Lord and The Lord Builds the House to my children and to my Sunday school class I am holding onto God's promise from Isaiah 55: 11 -- "So shall my word be that goeth forth out of my mouth: it shall not return unto me void, but it shall accomplish that which I please, and it shall prosper in the thing whereto I sent it." Snuggle up with someone you love as you slowly turn through these pages filled with not quite victorian and not quite country - but a mixture of the two that creates a very down home sweetness that is simply irristible. This is the perfect bedtime book if there ever was one! Young children, grandparents and all ages in between will be captivated by the sheer joy, love and intricate detail Johannah Bluedorn has placed in each illustration. Just when you are ready to turn the page, another intriguing image will catch your attention for yet another long, enjoyable study of a delightful scene. Each page is graced with earthly beauty which is based on the scriptures found throughout the 103rd Psalm. Only Johannah has given it deeper meaning. She has taken to heart each and every word King David wrote and placed those words into our homes, our families, our very lives. She has done this in such a humble, simple way by creating vivid illustrations of home and daily life that reflects the wisdom in the verse she uses. The beauty and exquisite detail found in each illustration captures the readers attention and continues to hold it indefinitely page after page. It is simply impossible to take in the entire illustration at one glace, or even within several minutes. While you meditate on the verses found in the 103rd Psalm, you gaze over exquisite detail, grace and beauty on each and every page. What a very unique and simple way to memorize this special Psalm. Whether it is a full page illustration, the details of which are unsurpassed in a child's picture book or a beautiful array of foliage with a glancing vignette to highlight the meaning of a verse, the book is captivating and cries to be read again, and again, and again. Truly a memory maker for children and parents as they slowly work through each page and happily share little details they have found carefully tucked away. And let's not forget the simple song score at the back of the book, simple enough for even young children to play on the piano or violin. The song contains the treble cleft notes and the words to the entire 103rd Psalm to sing along with. As soon as my middle daughter saw the music, she took out her violin and began to play, filling our home with a worthy song to sing. Definitely a keeper for this generation and the next. I've just discovered Johannah Bluedorn's books. She calls them children's books but I think they are for EVERYONE! Her style of painting is absolutely fascinating and so appealing to me. 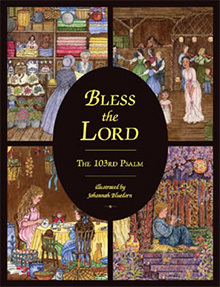 I have just purchased her new release of BLESS THE LORD - It is Psalm 103 from the KJV Holy Bible and illustrated so beautifully with her watercolors. She also has done one for Psalm 127. I will definitely be getting that one next! Each page of this book consists of a verse from the 103rd Psalm (in the King James Version) accompanied by the delightful paintings of Johannah Bluedorn. The combination of the beautiful King James English with her beautiful art makes this book an ideal gift and an ideal book to grace a coffee table. There is a sentence on the copyright page stating that the book is the “private property” of Johannah Bluedorn. The publisher, Trivium Pursuit, is the name of the organization established by her parents, Harvey and Laurie Bluedorn, to promote the usage of Classical Education methodology in Christian Homeschooling. I think it would have been a good idea to state this fact after the sentence. I learned it by going to the website address provided, www.triviumpursuit.com, which provides very helpful information. This beautiful book by the daughter of Classical Christian Homeschooling parents provides good evidence for the greatness of the Classical method, which I have long believed in and am happy to see finally being implemented in our time. Johannah Bluedorn, a homeschool graduate and self-taught artist, has illustrated this sweet children’s picture book of the 103rd Psalm. The words “Bless the Lord, Oh my soul”, beckons us to worship our Great God, and Ms. Bluedorn has uniquely combined each verse of this beloved Psalm to her original artwork. A girl walking in flowering meadows, a young boy in the arms of his father, a mare nuzzling her colt-each picture echoes the psalmist’s invocation, leaving the reader with an overwhelming sense of adoration towards God. The book is intended for children, but all members of your family will want to read this lovely book, lingering on each page, enjoying the beauty of the words and pictures. As you read, it’s as if you can almost hear music, and feel the soft rustling of a warm summer breeze. This charming hardcover picture book is a precious and endearing work, and you will plainly see Ms. Bluedorn’s love for God and family represented in her renderings. In just a few readings you and your children will have likely committed this psalm to memory, and will find yourselves giving heartfelt praises to God. Bless the Lord, oh my soul indeed! “She drew that,” Kiley, our resident artist gasped! “Look at that horse.” “I love that dress.” “Did you see the animals in their homes?” were a few of the many excited comments and questions pouring from my girls mouths as we opened these books. Johannah Bluedorn, a homeschooled girl and self-taught artist, has illustrated two lovely hardback books that are overflowing with gorgeously detailed color illustrations. Each page is a delight to the eye and requires a few minutes to savor and take all the loveliness in. In these pages her artwork serves the purpose of illustrating the Holy word of God. On the page that reads, “Bless the Lord, ye his angels, that excel in strength, that do his commandments, hearkening unto the voice of his word,” you see a boy stretched out on some grass with his arm draped across ____. As you look a little more closely you will see in the trees an angel watching over them. The girls and I spent about 30 minutes the evening these books came. We opened them intending to read them but instead we needed quite a while just to exclaim over the sweet wholesome pictures. After we had carefully looked at each page in both books we were ready to read. Then we found that the pictures were not just fun to look at. They successful help bring the point of the message across. Each piece of art is carefully done for that portion of scripture. Johannah Bluedorn has done it again. Bless the Lord is the second in what I hope will be a very long series of illustrated Psalms. The text of the book is simply the King James version of the 103rd Psalm, and the breathtaking illustrations do much to bring the words of the psalmist to life. Our family loves what we call "memory books" - books whose entire text is Scripture, or a hymn, or poetry, or some other special work. As we engage in that most natural daily activity of snuggling up and reading, the text of these books is written forever in our hearts and minds. I am sure that most mothers and their children can recite the words of Goodnight Moon or Madeline or Mike Mulligan and the Steam Shovel. We never set out to memorize these books, but through sheer joyful repetition we hid their words in our hearts and will never forget them. In just this way, Bless the Lord works to impress the words of Psalm 103 upon our children's hearts. The grace and charm of the illustrations will draw your children to this book over and over, while the winsomeness of the artwork clearly communicates the value and loveliness of God's Word. This book will put wholesome beauty before your children's eyes, and it will fill their souls with the majesty of the Creator. Johannah Bluedorn clearly shows her love of the Psalms with the children's picture book Bless the Lord. Her beautiful color artwork helps to express to young readers the meaning of the Psalm and gives a feeling of bygone days. The author's father, Harvey Bluedorn, sets the Psalm to music with an original composition shown on the concluding pages. Recommendation: Readers of all ages will adore Bless the Lord. Parents will be inspired by the art to have meaningful conversations with their children. Older children will enjoy the sheet music, while the very young will love the pictures. How do I measure whether a picture book is any good? Usually with one simple test - The Again Test. After reading the book aloud, one of the children will say, "Again! Read it Again!" At the same time I won't be groaning inside thinking, "No, Not Again!" Then I know I've found a good book. Using that rigorous standard, Johannah Bluedorn's book Bless the Lord passes with flying colors. When we first received the book, my nine year old daughter just stared at the cover illustrations and said, "Wow!" I knew then this book would be special. The pages inside are made of heavy weight paper. That quality is important to me. A good picture book needs to stand up to multiple turnings. And trust me, you'll want to turn the pages again and again in this book. The words are taken directly from the King James Version of the 103rd Psalm. Accompanying each verse is an absolutely beautiful illustration depicting old-fashion family life. The pages are bright and colorful, holding the interest of even my youngest child. As I read the verse, she often traces her fingers over one of the animals or tries to count the flowers in the border. Each time we snuggle up to read, we notice something different in the pictures. More importantly, because she wants to read the book "again" we have memorized the 103rd Psalm without much effort at all. This book is the second in a series. The first was Unless the Lord Build the House Psalm 127. She has also published Little Bitty Baby Learns Hebrew, The Story of Mr. Pippin, and my personal favorite My Mommy My Teacher -- the story of a day with a homeschooling farm family. Johannah Bluedorn was homeschooled and self taught in art. I would encourage all who are looking for quality childrens literature to check out Johannah Bluedorn's books. Around here they have become favorites. Each one quietly demanding to be read again and again. Thank you for the beautiful books you have written and illustrated. We were one of the winners in your recent contest: we chose Bless the Lord. Thank you for your generosity. We also have The Lord Builds the House which we purchased from Vision Forum earlier this year. You have created two lovely, warm invitations into the Psalms. I wanted to encourage you in how much you have already grown in your illustration abilities between the two books. The Lord Builds the House book is charming (and the Psalm selection is great) and yet your Bless the Lord book shows a great deal of improvement in your artistic skills. Namely I think your illustrations in Bless the Lord are so much more "fluid"; they seem to have "life" painted right into them! You have created more motion and greater expression in your characters which is hard to do! You have also improved in perspective (things look more real) and the body proportion of your characters is more life-like too. Thank you for all the hard work that went into these wonderful books. And thank you for the fine example you present to our family of a young woman nobly investing her time and talents. We look forward to purchasing your other books as we are able. And we look forward to other books you may produce in the future if the Lord wills. If you're a regular reader here, you know I like pretty! I can't think of a more beautiful book to start my 'Friday's Focus Reviews' with than Bless the Lord - the 103rd Psalm illustrated by Johannah Bluedorn. Beautiful, extraordinarily so, describes the illustrations in this book. While the themes of each picture of homey and reminiscent of simpler times and ways, the details are exquisite and yet with an impressionistic feel. There is a richness in the colors and textures that is not often found in picture books. Usually, we buy picture books for...well,...the pictures. This is one picture book that the words and the pictures are equally beautiful. This book is a delightful way to share precious scripture and lovely artwork with your family. Bless the Lord - the 103rd Psalm is a treasure, a treasure that with loving care, you'll want to pass on to future generations. Thank you, Miss Bluedorn, for a timeless work of love that feeds the soul and the senses. Psalm 103 comes to life in beautiful watercolor and ink illustrations. Each page lovingly depicts a slice of rural, colonial life. The scenes, idyllic and peaceful in nature, include a garden, country store, bedtime, playing with cows in a pasture, baking cookies, and dancing at a hoedown. The illustrations are creative and full of fun-to-find details that children and adults alike will find mesmerizing. The book concludes with a simple song score, easy enough for any budding musician to play. Throughout the pages of “Bless the Lord” you will be pleased to find a rich variety of color in the pictures and detail that goes unmatched. As a parent, the beauty and sentiment of each page makes me want to express the gloriousness of the Lord to my children as I read this beautiful Psalm to them. After years of reading children’s books to my kids with the same bold letters and primary colors, this beautiful book is one we will cherish forever. Every time you turn the page you can loose yourself in the detail of what Johannah wants to share with you in her art. From tiny books with their titles to a portrait above the fireplace with the 10 commandments scripted, this book can be a lesson or two on its own. A bonus to readers is the sheet music for Psalm 103 as written by Harvey Bluedorn, for use in family worship, or for beginner musicians. The inclusion of this music continues to gives evidence of how the Bluedorn family has taken the beautiful Word of God to heart as a source of training and instruction.